* Voice Descrambling (AR-Mini U version only). 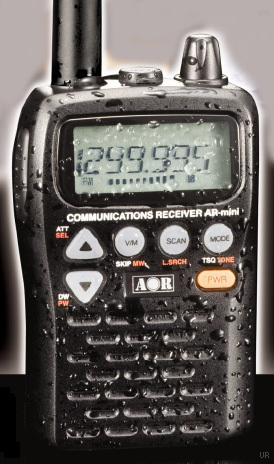 The AOR AR-Mini B handheld radio covers 100 kHz to 1300 MHz (less cellular) in: Wide FM, Narrow FM and AM modes. 1000 Alpha memories in 10 banks are supplied. Bandwidths are: FM-N/AM 15 kHz, FM-Wide 220 kHz (-6 dB). A TCXO is featured for great stability. 2.4 x 3.7 x 0.9 inches 7.4 oz. SMA type antenna. This small, but rugged receiver is water resistant (JIS4). The AR-Mini comes with two NiMH AA cells, AAmini AC adapter (6 VDC 500 mA), SMA flexible antenna, belt clip, hand strap and manual. The AOR AR-Mini U model is the same as above, but without the 824-849 / 869-894 MHz cellular gap. It additionally features a voice descrambling capability. This unblocked version was for government or qualifying commercial purchase order or for export only. #0225 DC-Mini DC Cable with cigar plug. Copyright 2008-2019 Universal Radio, Inc.